A diverse seed based diet with Quiko Egg Food Crumbles designed to meet the energy and protein needs of the parakeet. 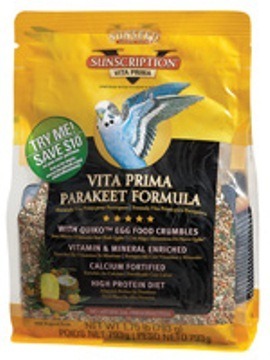 The addition of nutrient rich, highly fortified Vita-Bite Crumbles adds vitamins and minerals not normally found in a straight seed diet, promoting colorful feather growth and ensuring the overall health and well being of your pet bird. Eggs contain powerful antioxidants and are an excellent source of protein. With tropical fruits and carrots rich in Vitamin A, this colorful diet is attractive to all parakeets and is fortified with added calcium, necessary for all life stages. All Vita formulas are fortified with vitamin and minerals, contain beneficial bacteria (direct fed microbials) for digestive health, amino acids and Omega 3's for skin and feather conditioning, and antioxidants for immune support. Provide a cuttle bone at all times for your Canary. High in calcium they also aid in beak conditioning! For the health and well being of your parrot, this product should be offered freely. Fresh, clean water should be available at all times. Clean your bird's feed dishes daily by removing empty seed hulls and refilling with fresh seed. Fresh fruits and vegetables are appreciated by birds. When offered as a treat or supplement they can comprise as much as 20% of the total diet. White Millet, Oat Groats, Canary Grass Seed, Red Millet, Ground Corn, Flax Seed, Golden German Millet, Ground Wheat, Dried Egg Product, Safflower Seed, Corn Gluten Meal, Wheat Middlings, Dehulled Soybean Meal, Calcium Carbonate, Ground Oat Groats, Caraway Seed, Dehydrated Carrot, Dehydrated Papaya, Sesame Seed, Dehydrated Coconut, Dehydrated Pineapple, Monocalcium Phosphate, Dicalcium Phosphate, Vegetable Oil, Orange Extract, Salt, L-lysine, Spirulina, Potassium Chloride, DL-Methionine, Choline Chloride, Vitamin A Supplement, Zinc Sulfate, Zinc Oxide, Magnesium Oxide, Vitamin D3 Supplement, Vitamin E Supplement, Niacin Supplement, Vitamin B12 Supplement, Riboflavin Supplement, d-Calcium Pantothenate, Folic Acid, Pyridoxine Hydrochloride, Menadione Sodium Bisulfite Complex, Thiamine Mononitrate, Biotin, Manganese Sulfate, L-Ascorbyl-2-Polyphosphate, Copper Sulfate, Ferrous Sulfate, Potassium Iodide, Manganous Oxide, Torula Dried Yeast, Cobalt Sulfate, Sodium Selenite, Yucca Schidigera Extract, Honey, Dried Lactobacillus Acidophilus Fermentation Product, Dried Lactobacillus Casei Fermentation Product, Dried Enterococcus Faecium Fermentation Product, Dried Bifidobacterium Bifidum Fermentation Product, Dried Aspergillus Oryzae Fermentation Product, Color Added. Suneed's Vita Parakeet Formula is designed to meet the energy and protein needs of the Parakeet. The addition of nutrient rich, highly fortified Vita-Bite Crumbles adds vitamins and minerals not mormally found in a straight seed diet, promoting colorful feather growth and ensuring the overall health and well being of your pet bird.